>A popular Japanese green tea preparation, matcha may be beneficial for weight loss. Boosting metabolism. Matcha enhances the body’s thermogenesis and fat oxidation. ha refers to green tea that is prepared and consumed in a specific way. Tea plants (Camellia sinensis) are first grown in 90% shade, and the harvested leaves have their veins and stems removed. The leaves are then ground into a fine green powder known as matcha. The major difference between matcha and normal tea is that both the water-soluble and insoluble parts of the tea are consumed. Matcha originated in China during the Tang Dynasty (618-907) and spread to Japan at the beginning in the 14th century, where it became the cornerstone of an elaborate tea ceremony which survives to this day. Matcha is believed to have greater health benefits than normal green tea for 3 main reasons. 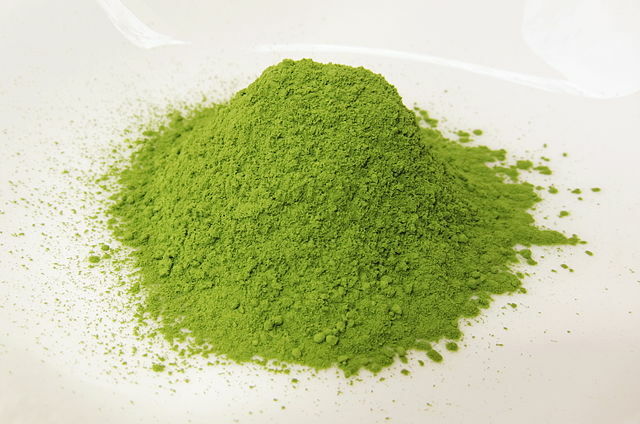 First, because it is grown in the shade, matcha has much higher catechin content. Catechins are organic compounds found in many plants that have a wide array of health benefits ranging from antioxidant activity to helping treat and prevent cancer. Catechins also appear to be beneficial for weight loss. In particular, matcha has an unusually high amount of epigallocatechin gallate (EGCG) – the main catechin in green tea. One study found that matcha had 137 times the EGCG content of Tazo China Green Tips – a popular green tea brand available in North America. The researchers also found matcha to have 3 times the highest mentioned EGCG content of other green tea studies.1 Given that EGCG is the main active component of green tea, this means that matcha has greater potency. Second, drinking matcha results in consuming not just the water-soluble ingredients, but also the insoluble parts of the powder, which are particularly high in fiber. This fiber may also be beneficial for losing weight. In modern-day Japan, matcha is consumed not just as tea but also as an ingredient in dumplings, ice cream, cake, sushi rolls, and other foods. Matcha’s popularity is also growing in North America, as demonstrated by the green tea latte offered at Starbucks, as well as the establishment of specialized matcha cafes and bars. First, a sieve is used to break up clumps of matcha powder into a tea cup or bowl. Next, just below boiling temperature water is added. The matcha is then mixed with the water by using a whisk. Once the tea has a frothy texture and looks well-mixed, matcha is ready for drinking. o aid weight loss in the same way as any green tea – through the interplay of several active components which include EGCG and other catechins, l-theanine, and caffeine. The major difference, however, is that matcha has much higher EGCG and l-theanine content, which results in even greater therapeutic effect. Catechins are the main active ingredient of green tea, with EGCG being the most abundant. Tea catechins are believed to improve fat oxidation, reduce dietary fat absorption, and boost exercise performance. Catechins work primarily by inhibiting catechol-o-methyl transferase (COMT), an enzyme which breaks down catecholamines – compounds including epinephrine which play an important role in the regulation of fats. As a result, catecholamine levels go up and more fat is burned. Furthermore, tea catechins function by activating AMPK, an enzyme which plays a role in the body’s energy balance. In addition, catechins are also believed to reduce the digestion and absorption of fats in the small intestine by inhibiting the action of several enzymes. EGCG in particular has been shown to inhibit the action of pancreatic lipase – a key fat digestion enzyme. On the other hand, l-theanine is the ingredient responsible for the relaxed concentration feeling of tea. This is achieved by theanine promoting the production of alpha brain waves, which are associated with calmness and alertness, while also stimulating the action of the neurotransmitter γ-aminobutyric acid (GABA) which is responsible for inhibiting the levels of dopamine and serotonin, and may boost the relaxation effect further.5 This effect can aid weight loss indirectly, by enhancing overall mood and making it easier to control one’s diet. Moreover, it is also possible that l-theanine can aid weight loss directly – one study found that l-theanine administered to mice reduced their food intake. This effect has yet to be tested in human trials, however. Finally, it is also possible that fiber may play a role in matcha’s effectiveness, since drinking matcha includes ingesting the insoluble parts of green tea. One study found that consuming only the insoluble part of matcha had a similar, albeit weaker effect to consuming whole matcha. The researchers attributed this to the fiber content of matcha residue. Diets rich in fiber have been linked to weight loss, given its ability to make you feel full without adding too many extra calories. studies of matcha and green tea show mild weight loss benefits. This comprehensive review examined dozens of studies done on the weight loss effects of tea, primarily in animals. Although the researchers stress that tea’s mechanism of action is not yet fully understood, they believe that it affects bodyweight through 2 main mechanisms: catechins decreasing absorption of fats and proteins; and activating AMPK, an enzyme important to energy balance. The review confirmed the weight loss benefits of tea, and found green tea in particular be most effective. This study sought to examine matcha’s effects on various factors associated with obesity and other metabolic disorders. Seventy mice were divided into 7 experimental diets for 4 weeks: normal diet (NC), high-fat diet (HF), high-fat with 0.025% matcha (MLD), high-fat with 0.05% matcha (MMD), high-fat with 0.075% matcha (MHD), high-fat with 0.05% matcha aqueous extract (ME), and high-fat diet with 0.05% matcha residues (MR). The study found that intake of both the extract (water-soluble) and residue (non-soluble) lowered weight gain compared to the high-fat diet group, and combining the two in whole matcha had a stronger effect. Furthermore, both the extract and residue resulted in reduction of blood glucose and fat levels, which are indicators of obesity. The researchers theorize that the insoluble parts of matcha are helpful not just because of their catechin content, but also fiber. This study examined the anti-obesity effects of the 3 major components of green tea – catechins, caffeine, and theanine. A total of 100 mice were fed one of 10 diets for 16 weeks: normal control diet, diet with 2% green tea powder, diet with 0.3% catechins, diet with 0.05% caffeine, and diet with 0.03% theanine, or 5 more diets that mixed the different compounds. These percentages corresponded to the amount of the compounds present in a 2% green tea powder diet. The trial found that all 3 compounds used alone or in combination reduced weight gain. Theanine was found to have the strongest impact on weight loss, and also had a noticeable effect on food intake, which suggests that it works by suppressing appetite. This study examined the effects of green tea catechins on exercise-induced fat loss in overweight/obese adults. A total of 107 participants were randomly assigned to either the 625 mg/day catechin plus 39 mg caffeine group, or the 39 mg caffeine control group for 12 weeks. All participants also engaged in moderate exercise. The catechin group lost an average of 2.2 kg compared to only 1 kg for the control group. This study looked at the weight loss effects of a high dose of green tea extract, with the primary component being the catechin EGCG. A total of 92 obese women were assigned to the placebo or extract containing EGCG 856.8 mg/d group for 12 weeks. The women given the extract lost an average of 1.1 kg – about 1.4% of their weight, and also had lower levels of cholesterol and low-density lipoprotein (LDL), which are elevated in overweight individuals. The researchers suggest that EGCG works primarily by increasing fat oxidation. This study wanted to see whether decaffeinated green tea could improve exercise performance. Fourteen active men were assigned to a decaffeinated green tea extract (dGTE) 571 mg/day or placebo group for 4 weeks. DGTE contained 400 mg of EGCG per 571 mg dose. The men performed a cycling exercise at week 0, 2, and 4. The dGTE group had 24.9% higher fat oxidation and lost 1.63% body fat by week 4 vs 0.66% for placebo. They also felt that the exercise was easier compared to placebo, and travelled 10.9% further on week 4 than week 0.
of studies examined green tea in general. Commercial products recommend ½ to 1 teaspoon matcha powder per serving. le to experience some adverse effects of caffeine if a large amount of green tea is consumed. These include vomiting, insomnia, irritability and headaches. Matcha is a weight-loss multi-tasker. Supplying 3X the active EGCG antioxidant compounds as regular green tea, it may be a triple-strength powered fat-burner. Make it as tea, or use it in smoothies, lattes and recipes to support your weight management goals.